Liam Hemsworth (Hunger Games), has been over-shadowed lately by his older brother, Marvel’s The Avenger’s star Chris Hemsworth, and his fiance, Disney alum and pop-star Miley Cyrus. Liam isn’t worried, he knows he’ll be stepping into the spotlight again on August 16, when his latest film Paranoia debuts. Paranoia is picking up rapid word-of-mouth buzz . It’s got Hollywood legend Harrison Ford (Indiana Jones, Star Wars), in the role of a bald mean guy, and Gary Oldman (The Dark Knight, Lawless) playing his nemesis. Robert Luketic (Monster-In-Law, Legally Blonde), is directing. And last but not least, it’s got a screenplay adapted from Joseph Finder’s 2004 high-stake thriller of the same name, by Barry L. Levy (Vantage Point), and the white-hot Jason Dean Hall. According to Slashfilm, Hall’s newest script, American Sniper, based on the true story of the late Chris Kyle, is in development with Bradley Cooper (Silver Linings Playbook), with Steven Spielberg in talks to direct. Hall is poised to adapt the book Thank You For Your Service, which Spielberg is reportedly negotiating to direct as well, with the idea of reuniting with his Lincoln star Daniel Day-Lewis in the lead. In Paranoia, Liam Hemsworth plays a low-level employee at a prestigious technological corporation. A foolish prank lands him in a plush corner office. It’s not a promotion. 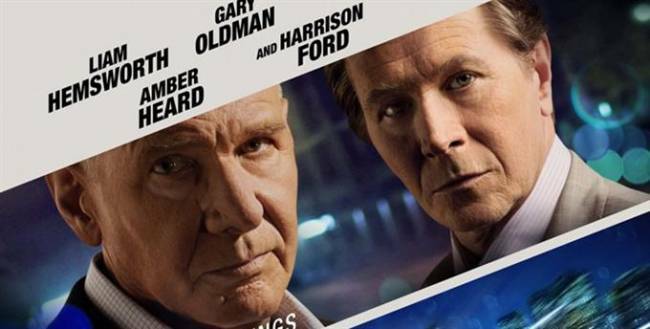 In order to keep his job, his boss (Gary Oldman), forces him to participate in an undercover corporate espionage assignment at a rival’s (Harrison Ford) company. Amber Heard plays his love interest. Look for Paranoia to debut in theaters August 16, 2013.